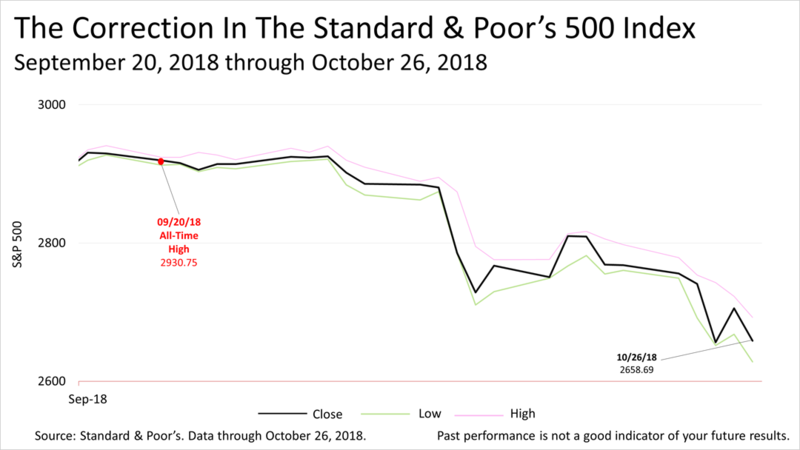 The Standard & Poor's 500 index fell into correction territory Friday — dropping more than 10% since hitting its all-time high — and closed the week at 2,658.69. The total return on the S&P 500 in the third quarter of 2018 was a strong 7.7%, but volatility since lopped off 9% of its value from its all-time closing high. Share prices had hit a closing peak on September 20 of 2930.75 before tumbling to a 2629.18 low on Friday morning, meeting the definition of a market correction. 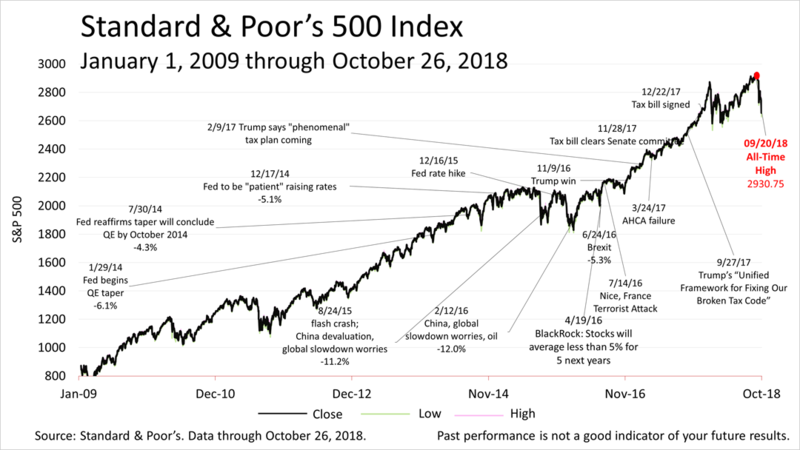 Market corrections of 10% or even 15% on swings in investor sentiment are not uncommon events in long-term bull market periods historically accompanying economic expansions. Bear market drops of 20% are much less common and most bear markets coincide with economic recessions. No evidence of a recession was on the horizon Friday. On Friday, the federal government reported that the economy grew by 3.5% in the third quarter of 2018, compared to the 4.2% growth in the second quarter, according to the U.S. Bureau of Economic Analysis. The 3.5% growth rate is the second-best quarterly GDP growth rate experienced in the past 16 quarters and it was in line with expectations. 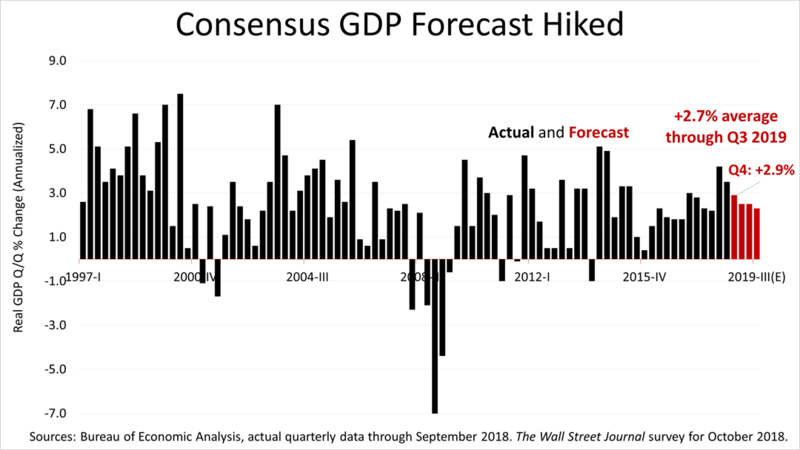 The 60 economists surveyed by The Wall Street Journal in early October predicted GDP would grow in the third quarter by 3.4% and an average quarterly GDP growth rate over the five quarters ahead of 2.7%. While the precise cause of a market correction is always debatable, earnings expected on the S&P 500 companies in 2019 is likely a factor. 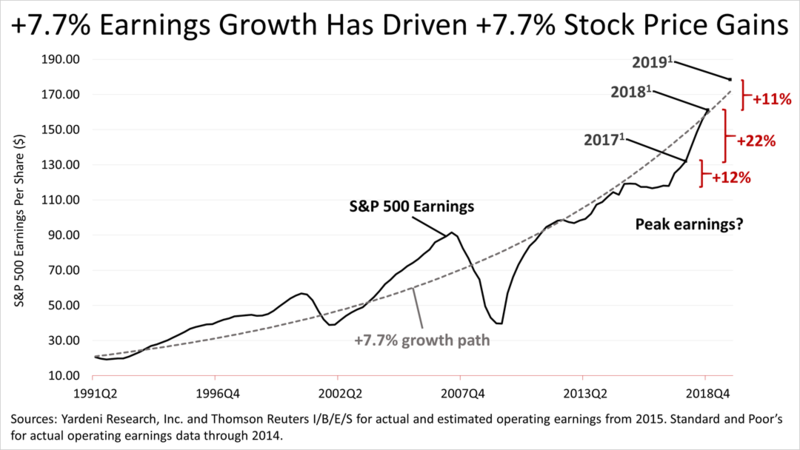 Wall Street earnings growth expectations for 2018 and 2019 of 22% and 11%, respectively, are well ahead of the S&P 500's historical trend rate of growth. This accounted for the market's strength in recent months, as the long bull run recently became the longest-ever bull market in post-War America. With 2018 nearly over, the expectation of 11% profit growth for 2019 is now a focus. To achieve the 11% earnings growth Wall Street analysts recently said they expected in 2019, profit margins on the S&P 500 would need to expand considerably, based on recent sales revenue. This the longest bull market in modern history and a correction can be unnerving. No one can predict the market and past performance does not guarantee your future results, but the economy remains strong. Moreover, expecting a slower rate of sales and earnings growth in 2019 is not the same as expecting a decline in sales and earnings. Market corrections should be an expected part of a long-term investor's plan, along with changes in sales and earnings expectations that cause volatility. 12017, 2018 (estimated) and 2019 (estimated) bottom-up S&P 500 operating earnings per share as of October 1, 2018: for 2017, $131.98; for 2018(e), $161.19; for 2019(e), $178.43. Sources: Yardeni Research, Inc. and Thomson Reuters I/B/E/S for actual and estimated operating earnings from 2015. Standard and Poor's for actual operating earnings data through 2014. This article was written by a professional financial journalist for Periope, LC and is not intended as legal or investment advice.